DoorBird lets the homeowner answer the door from anywhere in the world with an Internet enabled smartphone. 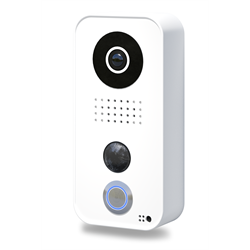 DoorBird will send a push notification to the registered phone(s) when the visitor presses the doorbell button or when motion is sensed so the homeowner can see the visitor and optionally have a conversation with them. Or check in any time you like proactively. The cloud service, DoorBird iOs and Android apps are all free. At no extra charge, Doorbird will also save high def 720p image snapshots of the most recent button press events and motion trigger events. These can be accessed any time from the app. Users have the option to purchase a cloud recording service directly from Doorbird after installation, which will provide 720p video clips stored for 7 days. Motion event triggers can be enabled, disabled, and the user may modify the motion sensor regions to reduce false triggers caused by street traffic or other passersby. DoorBird is a high quality German designed and engineered product. With all of these advantages, DoorBird is perfect for high end installations, professional integrators as well as tech savvy homeowners. DoorBird requires a connection to broadband Internet via WIFI or Ethernet, and wired power using PoE or the included power supply. Minimum 0.5 mb/s upload speed.